We hear a lot about post traumatic stress, when people suffer from a great shock or witness a terrible event. Two of Jesus followers were in such a state when they set off on the seven mile walk from Jerusalem to Emmaus. They had seen their hopes in Jesus shattered and they had seen him cruelly put to death on the cross. Those who have lost somebody they love will know something of the pain and distress of bereavement, the shock is real and no amount of expectation can prepare us for the separation which follows. It was at that time, when all optimism was lost, that Jesus spoke to these disciples. 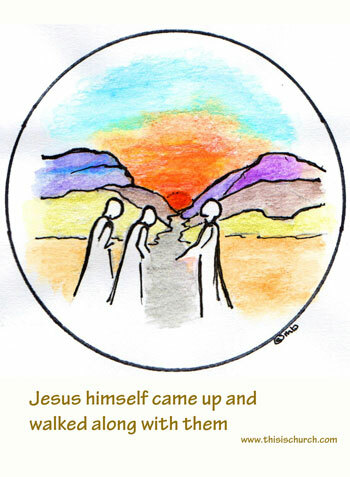 As Jesus spoke to them they realised who he was and through their confusion and loss they had hope reawakened. All of those who seek reassurance and encouragement should read this story and perhaps discover afresh the sense of anticipation which those disciples found, that all would be well. Then Peter stood up with the Eleven, raised his voice and addressed the crowd: “Therefore let all Israel be assured of this: God has made this Jesus, whom you crucified, both Lord and Christ.” When the people heard this, they were cut to the heart and said to Peter and the other apostles, “Brothers, what shall we do?” Peter replied, “Repent and be baptized, every one of you, in the name of Jesus Christ for the forgiveness of your sins. And you will receive the gift of the Holy Spirit. 39The promise is for you and your children and for all who are far off–for all whom the Lord our God will call.” With many other words he warned them; and he pleaded with them, “Save yourselves from this corrupt generation.” 41Those who accepted his message were baptized, and about three thousand were added to their number that day. Since you call on a Father who judges each man's work impartially, live your lives as strangers here in reverent fear. For you know that it was not with perishable things such as silver or gold that you were redeemed from the empty way of life handed down to you from your forefathers, but with the precious blood of Christ, a lamb without blemish or defect. He was chosen before the creation of the world, but was revealed in these last times for your sake. Through him you believe in God, who raised him from the dead and glorified him, and so your faith and hope are in God. Now that you have purified yourselves by obeying the truth so that you have sincere love for your brothers, love one another deeply, from the heart. For you have been born again, not of perishable seed, but of imperishable, through the living and enduring word of God. Now that same day two of them were going to a village called Emmaus, about seven miles from Jerusalem. They were talking with each other about everything that had happened. As they talked and discussed these things with each other, Jesus himself came up and walked along with them; but they were kept from recognizing him. He asked them, “What are you discussing together as you walk along?” They stood still, their faces downcast. One of them, named Cleopas, asked him, “Are you only a visitor to Jerusalem and do not know the things that have happened there in these days?” “What things?” he asked. “About Jesus of Nazareth,” they replied. “He was a prophet, powerful in word and deed before God and all the people. The chief priests and our rulers handed him over to be sentenced to death, and they crucified him; but we had hoped that he was the one who was going to redeem Israel. And what is more, it is the third day since all this took place. In addition, some of our women amazed us. They went to the tomb early this morning but didn't find his body. They came and told us that they had seen a vision of angels, who said he was alive. Then some of our companions went to the tomb and found it just as the women had said, but him they did not see.” He said to them, “How foolish you are, and how slow of heart to believe all that the prophets have spoken! Did not the Christ have to suffer these things and then enter his glory?” And beginning with Moses and all the Prophets, he explained to them what was said in all the Scriptures concerning himself. As they approached the village to which they were going, Jesus acted as if he were going farther. But they urged him strongly, “Stay with us, for it is nearly evening; the day is almost over.” So he went in to stay with them. 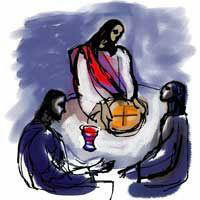 When he was at the table with them, he took bread, gave thanks, broke it and began to give it to them. Then their eyes were opened and they recognized him, and he disappeared from their sight. They asked each other, “Were not our hearts burning within us while he talked with us on the road and opened the Scriptures to us?” They got up and returned at once to Jerusalem. There they found the Eleven and those with them, assembled together and saying, “It is true! The Lord has risen and has appeared to Simon.” Then the two told what had happened on the way, and how Jesus was recognised by them when he broke the bread. Luke’s Gospel was written towards the end of the first century and Luke is writing to people who had not seen Jesus in the flesh. However Luke makes plain through this story that Jesus is not just a real historical person, he is also a living presence. He tells his readers through this story that Jesus rose from the dead, appeared to his followers and significantly he was made known to these two followers when he broke bread. This moved the minds of his readers to how Jesus could become alive to all people as they too partook of the sacred meal of the Holy Communion or Eucharist. Cleopas continues 'chief priests and our rulers delivered (Jesus) up to be condemned to death, and crucified him'. It is interesting that no mention is made of the Roman authorities or crowds. Luke clearly holds the Jewish leaders responsible for the death of Jesus. All of the hope which they had shared now seemed to Cleopas to have turned into wishful thinking, the murder of Jesus and the terrible nature of his death was not something which they had reckoned with. The words are full of sadness, hope is used in the past tense ‘we were hoping’ now all hope is gone. Today we can look back with hindsight and we see the death of Jesus as a part of God’s plan for the salvation of the world. We have to somehow place ourselves into the shoes of those first believers who could not come to terms with the notion that the Messiah could ever come to such a despicable end, it was completely contrary to everything which they had come to expect. Jesus reprimands the two for failing to believe the scriptures. Jesus clearly believed that in the Jewish scripture there was sufficient clue as to what God was doing in the suffering, death and resurrection of Jesus. We don’t know which scriptures Jesus used from the Old Testament but if you wanted a taste you could look up the following - Deuteronomy 18:15; Psalm 2:7; 16:10; 110:1; 118:21-23; Isaiah 53; Daniel 7:13-15; Hosea 6:2; and Amos 9:11. When they arrive at the village, which was perhaps their own home, Cleopas and his companion prevail upon Jesus not to travel on but to stay with them. It was customary that such hospitality would be offered, and declined unless it was insisted upon and this is what takes place. When they eat we are told that Jesus ‘took’, ‘blessed’, ‘broke’ and ‘gave’ bread. These are very particular actions which are clearly intended to be Eucharistic, this is the Lord’s Supper or Holy Communion. These are almost exactly the words that Luke used to describe Jesus’ actions at the Last Supper (22:19) and nearly identical words are also used in the stories of the feeding of the 5000. Normally, the host would perform these actions in a home and the celebrant would perform them in a worship service. Jesus, the guest, however becomes both the host and celebrant at the meal. Then we are told 'Their eyes were opened, and they recognized him.' This recalls the first meal in the book of Genesis where Adam and Eve eat the forbidden fruit. In that case too, 'their eyes were opened' and they knew that they were naked. In this instance however 'their eyes were opened' and they recognized Jesus. We are being told that this meal of Jesus, this eucharist, reverses a sin as old as time. From creation and the crime of Eden, humanity has dwelt in sin, until now when new creation takes place. This is the meal of new creation. We are told that their awareness had been increasing throughout their time with Jesus as the scriptures were opened to them. They reflected how their hearts had been burning as Jesus was opening the scriptures to them on the journey. So the story becomes a testimony to the power of the God's Word and the sacrament to the Christian community. The message of Luke is clear, read the scriptures, share in God’s sacrament and you will feed on the grace and strength of God. ‘A walk with God.’ God seeks to walk with us and console us in many ways, sadly we so often fail to recognize his presence. We are so caught up in the past, sp pre-occupied with ourselves that we fail to see God alongside us in our need. Pope John Paul II said "Before God, each human being is always unique and unrepeatable, somebody thought of and chosen from eternity." Christ our friend, you ask for our love in spite of our betrayal. Give us courage to embrace forgiveness, know you again, and trust ourselves in you; we pray in your name. Amen Methodist Worship. Lord Jesus you used the usual to reveal the unusual. The stranger remained a stranger until dinnertime. Then you took bread and blessed it. You took the cup and gave thanks. You transformed an ordinary meal into holy time that transformed their weak hearts into burning hearts. Help us so to find our ordinary situations transformed by your incredible presence. Lord Jesus be our companion on the road which we travel. Use us to bless the lives of others and to be a part of your revolutionary movement to transform the world. May we too be your disciples, ready to follow and willing to lead others to a relationship with you. Our reading today from Luke tells the story of two otherwise unknown disciples who are making the seven mile walk away from Jerusalem to Emmaus. The two disciples have left Jerusalem after Jesus' bloody Passover death. They perhaps heard about the women's report and Peter's account of the empty tomb (24: 1-10); but they do not feel convinced enough by the rumours and so they depart for home. On their journey, in which they must have felt despondent, they meet a stranger. How they could walk for seven miles with Jesus and not know who he was is a mystery to us, however to ask the question is perhaps to miss the point. Remember Luke is a writer and he tells his story to make his points like all writers do. Even some preachers today have been known sometimes to stretch things a bit in order to make a point! Of course the message of Luke is clear, Jesus' appearance has changed and that recognising him requires more than physical sight. No matter what doubts they have had about Jesus, when he broke the bread there could be no mistaking that they were in the presence of the risen Lord. So it was that the early church gathered regularly to share together in breaking bread, this was at the heart of what it meant to belong to the church (Acts 2:42). Of course the Emmaus story guides us to learn that Jesus is still revealed and met as we Christians gather together and break bread. Bishops and scientists have expressed to the Prime Minister their shared concerns about science teaching at Emmanuel City Technology College in Gateshead, and called for strict monitoring of the curricula of proposed faith schools. Signatories to a short letter to Tony Blair include the our own Bishop of St Albans as well as Bishops of Oxford, Hereford, Birmingham, Southwark and Portsmouth. They argue that the theory of evolution is not a “faith position”, as the school maintains, and call for the respective disciplines of science and religious studies to be properly respected. The school is sponsored by conservative Evangelical groups and teaches that evolution is only a theory competing with creationism. They believe that the world is only a few thousand years old and was created in six days at a period of fairly recent history. In the House of Commons, the Prime Minister defended Emmanuel — referred to by one columnist in The Guardian as a “fruitcake school” — as “achieving very good results”. The Bishop of Oxford, the Rt Revd Richard Harries, said on Wednesday that “young-earth” creationists brought Christianity into disrepute.“ You may like to reflect yourself on your own response to those who claim that the Bible gives us a literal history of a world which is only a few thousands years old. Those who hold to a view that the world has been millions of years in the making, perhaps with species evolving over time, would nevertheless want to say that behind all this there is a loving and purposeful God.